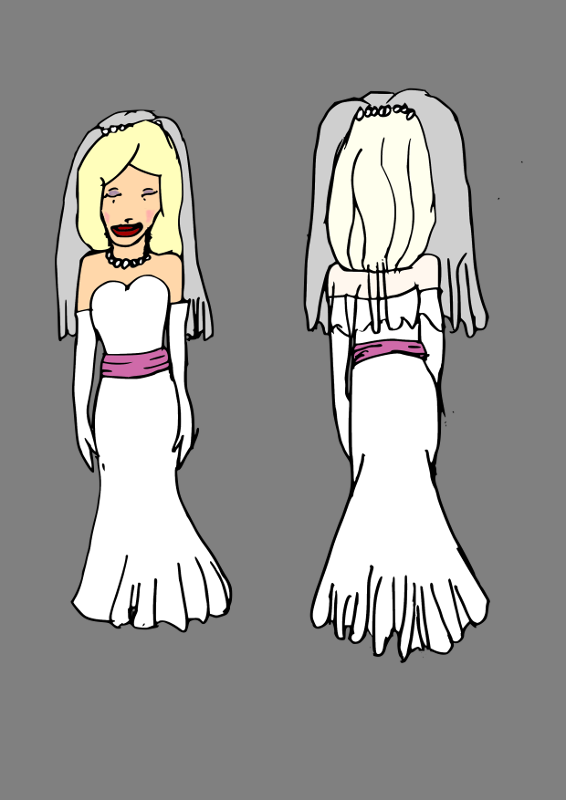 The reason why I entered the wedding dress contest was to test my artistic and character design skills. I have aspirations as a cartoonist and animator (in fact I’ve always wondered what a Luann animated series would look like! ), and this was really a test to see what the public’s reaction to my art in its current state really is. What man doesn’t enjoy looking at pretty girls? Well, for me it’s not just for my personal satisfaction. Even though I am male, I am not afraid to look at women’s fashion magazines for hair, makeup and clothing inspirations for female characters. I’ve always liked Old Hollywood Glamour and part of the dress design was inspired by that era. One of the goals in designing the dress was to not go overboard on minute details. As most of my characters are designed with the intention of being animated (hand drawn, not CGI–not my style! ), I have an aversion to any details that would be hardly noticeable to viewers. Too many details can mean spending anything up to three hours for a drawing that lasts on screen for only one twenty-fourth of a second. Multiply that by total screen time of a character, and it really slows you down, and other animators you’re working with will probably have some choice words to say about your highly detailed design. Fortunately Greg has to draw this dress no more than maybe three or four times a day (for a daily strip), but I still wanted to be considerate to the short turnaround time of a daily comic strip. The “perfect” formula for an old Hollywood-inspired wedding gown that I decided upon was a strapless dress with a sweetheart neckline and a flared “trumpet” skirt. It’s actually part pencil skirt and part circle skirt–hugging every curve in Toni’s body until a point about two inches below her kneecap, when it flares out to the floor. I did consider a ballgown-style dress, but the ideas for such a dress that I had I felt were too labor-intensive for a newspaper comic. Originally the dress was going to have an exposed back, but I was concerned that it would be inappropriate for a wedding gown (though I later found out it was permissible) so I left her back covered. Also, I almost didn’t include the pink sash around her waist. I only added it to give a little bit of visual interest. The pink color was purely arbitrary, just so it stood out from the pure-white gown. The long opera gloves may seem a little weird to some people, but I personally believe that opera gloves are one of the hallmarks of women’s formal wear and are really the icing on the cake (no pun intended). Although once a common accessory used in conjunction with cocktail dresses, evening gowns, ball gowns and wedding dresses, they seem to be very rare in this day and age. But I felt the gloves helped make the look unique, and on the bright side, if Toni wore gloves, she wouldn’t have to worry about painting her nails or getting a manicure! I didn’t really bother designing shoes for her because the skirt went all the way to the floor and thus her feet wouldn’t be visible most of the time. Admittedly if I had won the contest and Greg asked me what her shoes would look like, I’d say just use some generic pumps or spiked heels, preferably white to match her dress. The only other accessories I gave her were a pearl necklace (with matching earrings, although depending on the hairstyle they wouldn’t be visible anyway) and a below-the shoulder length veil attached to the back of her head by a barrette. I didn’t want to make the veil too long just to save a little labor on Greg’s part. However, I did plan the “behind-the-veil” colors for Toni’s hair and skin color–the colors were brightened a little bit and desaturated by about 40%. As far as hair and makeup, I didn’t put much thought into her hair. Originally I was thinking of loose waves, but ultimately I got lazy, especially in the rear view. My intention was that Greg would come up with a better hairstyle than I could. In terms of makeup, I know lavender eyeshadow and red lipstick are cliches, but I felt that if Toni ordinarily goes without makeup because of the demands of her occupation (and also the implication that she’s part-tomboy), she’d still wear makeup on special occasions, and with her wedding day being the most important day of her life, and she wants to look her best. Originally I thought that Toni’s lipstick would be a fire-engine red shade (considering that she’s a firefighter! ), but I decided on a darker red, which gives better contrast with her skin tone. And yes, I realize I overdid the blush, but they’re not called “blushing brides” for nothing! This contest was a learning experience for me and gives an idea of what I can improve in the future, though I will admit, being accustomed to my own cartooning style made it a little bit difficult to adapt to Greg’s style!